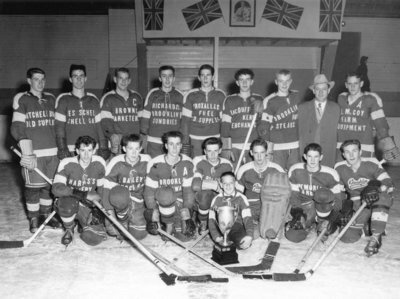 Black and white photograph showing the 1955-1956 Brooklin hockey team that won the Ontario Minor Hockey Association Junior D Championship. The photograph was taken at an arena. The team is posing with the trophy. Back row: Murray Jones, Garnet Warriner, Doug Vipon, Jack Owens, Charles Grandy, Donald Tran, Robert Carnegie, Cliff Johnston, William Cornish. Front row: Elmos Gibson, Paul Tran, Neil Pascoe, Grant Jones, Robert Johnston, Donald Vipond, John MacDuff. The Brooklin hockey team previously won this title in the 1954-1955 season. Brooklin Hockey Team, April 1956, David Edge, Whitby Archives, 21-005-044.